I'm going to take all of you through our wonderful wedding day. 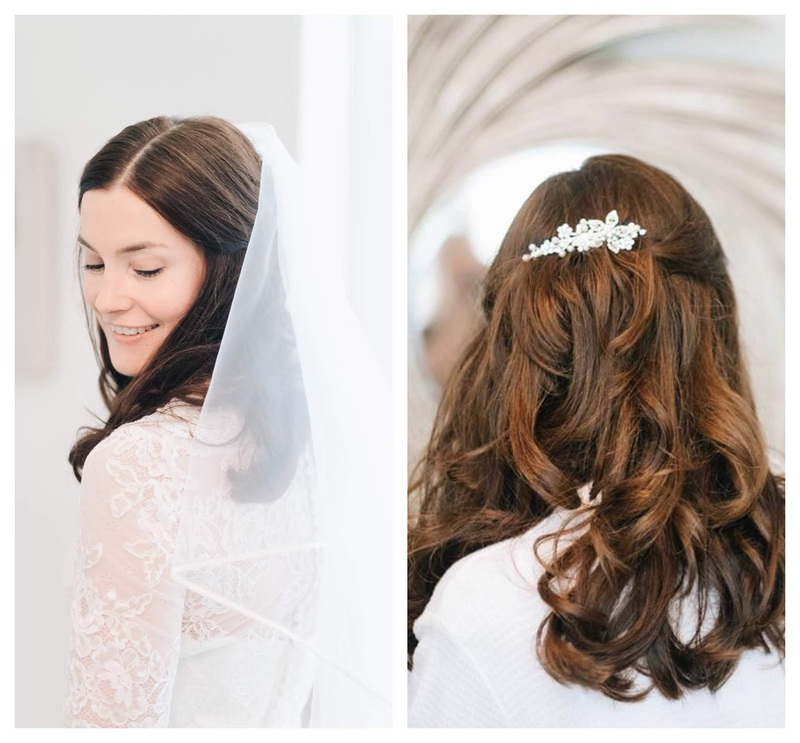 Firstly, if you're a bride-to-be, let me assure you that all the stress and hard work in the run up to your wedding day is definitely worth it. 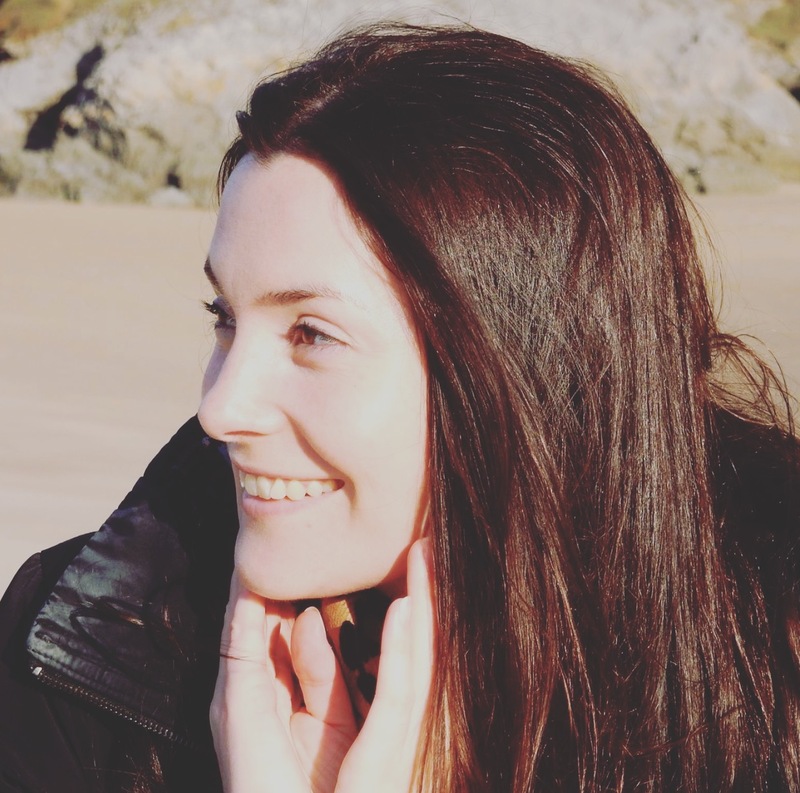 There is so much to organise and it can be a bit of an emotional rollercoaster and not everything will run smoothly, but when the day eventually arrives it will be amazing in ways you didn't anticipate. There are a lot of people to thank; to everyone that came, thank you for sharing our day with us, you hold a special place in our hearts. Thank you especially to our parents for helping to make our day so special. 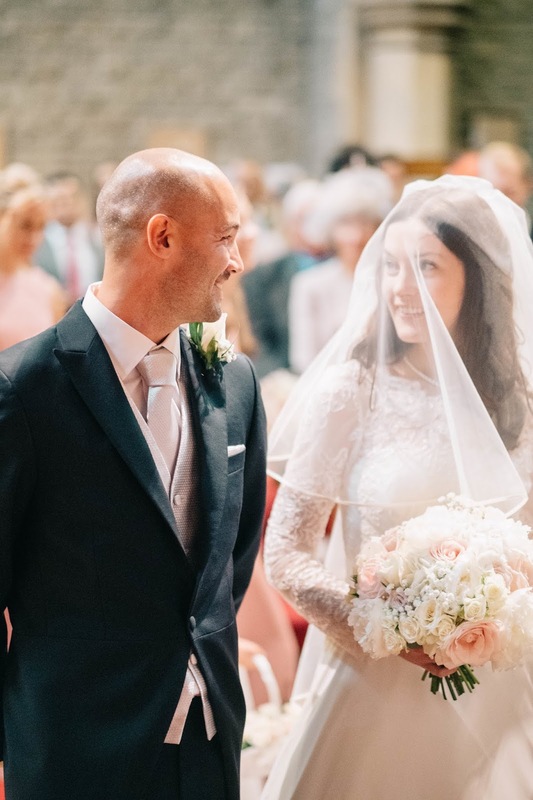 So....on Saturday 26th May 2018, I got married, a day that David I had been planning for just over a year finally arrived, and the whole day felt like a dream. I know it sounds like a bit of a cliché but it really did feel like that. 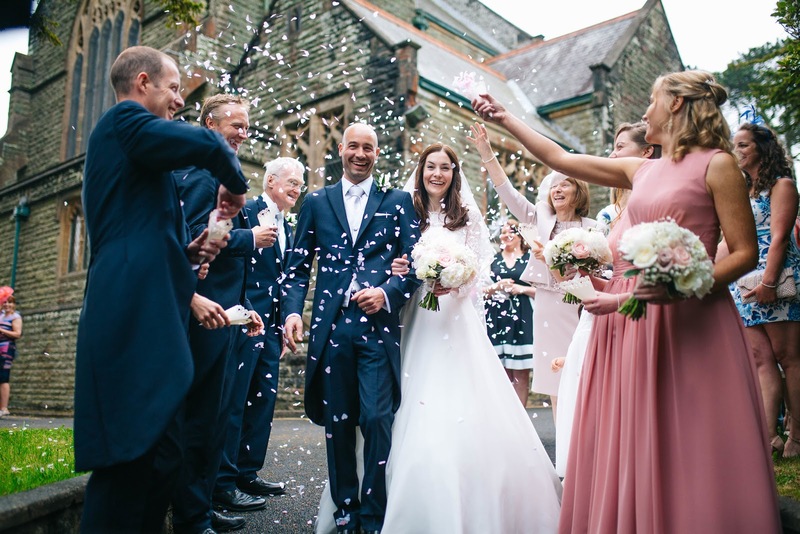 David and I wanted to get married in Wales as we both live in Swansea and we also wanted to share our special day with as many of our friends and family as possible. 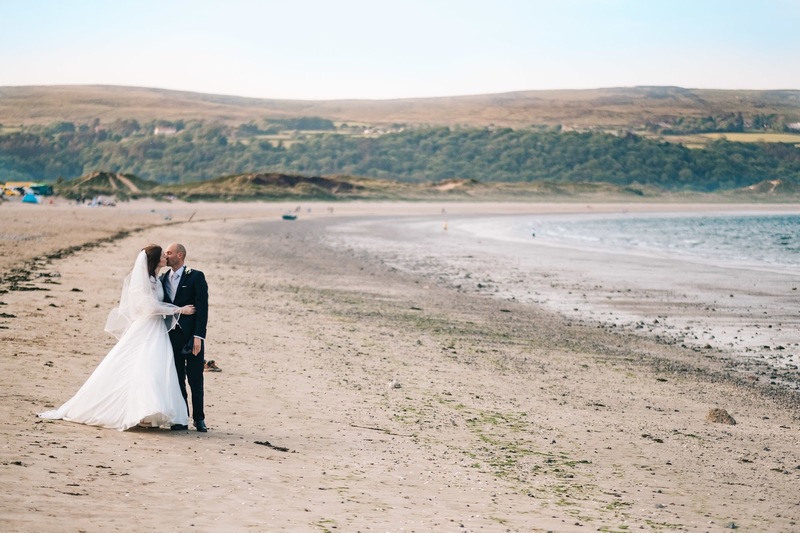 We got married in a beautiful local church and had our reception at Oxwich Bay Hotel, which overlooks the beautiful Oxwich Beach (more on that later!). 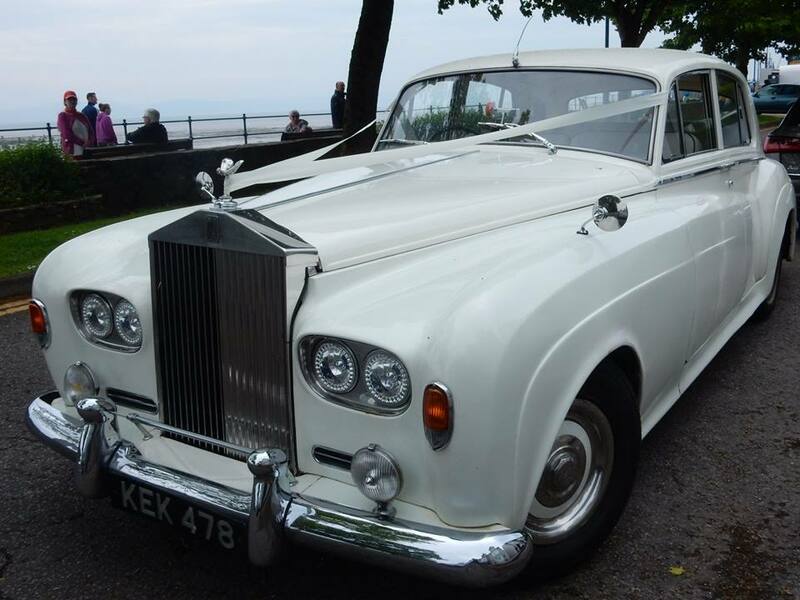 On the morning of the wedding I got ready with close family in a holiday home on Mumbles seafront; my parents had rented this to accommodate family who were visiting from overseas. It was such a beautiful place to get ready. My family had decorated the kitchen with bunting and put pretty bows on the potted trees outside the front door. Mum also made a buffet breakfast for everyone to help themselves to. 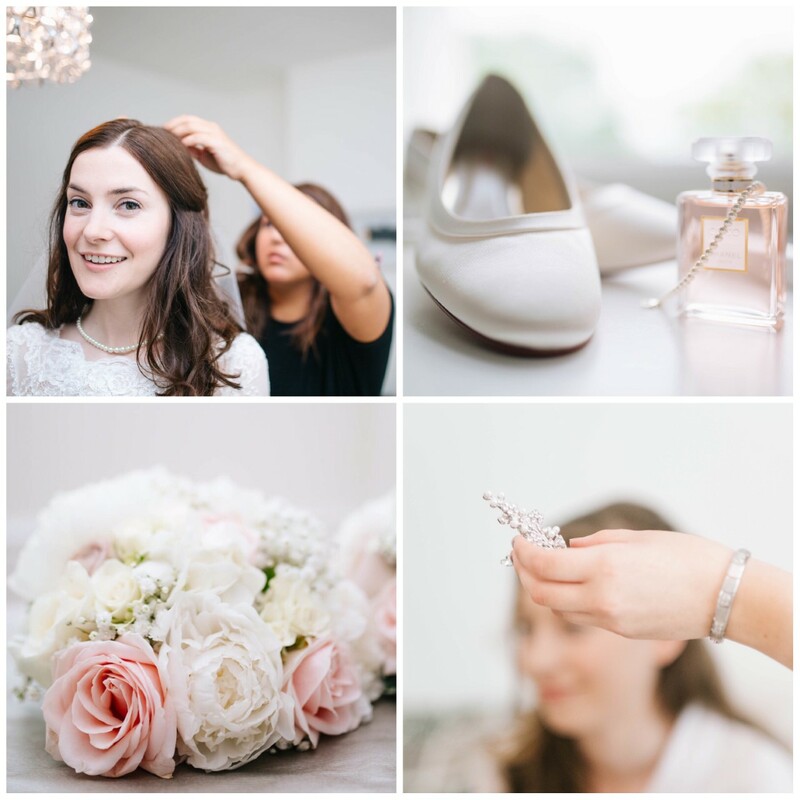 The rest of the morning was a bit of a whirlwind with lots of visitors arriving at the house; the bridesmaids, the hair stylists, the photographer, the florist, and the driver. 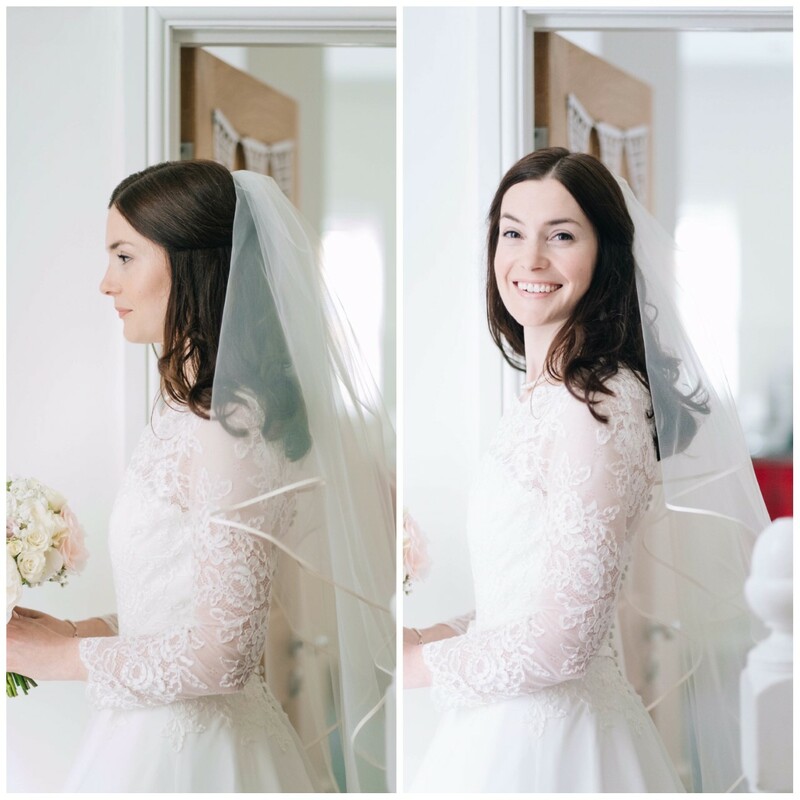 The hairstylists commented on how calm I was and that it was the most chilled out house they had ever been to on the morning of a wedding. I think that this was because we'd done all our worrying and planning in the lead up, so by the time the day came we were ready! It was nice and relaxed getting ready and I enjoyed the build up, even with the butterflies in my tummy. I did my own makeup and I had my hair styled in a half up-half down style. 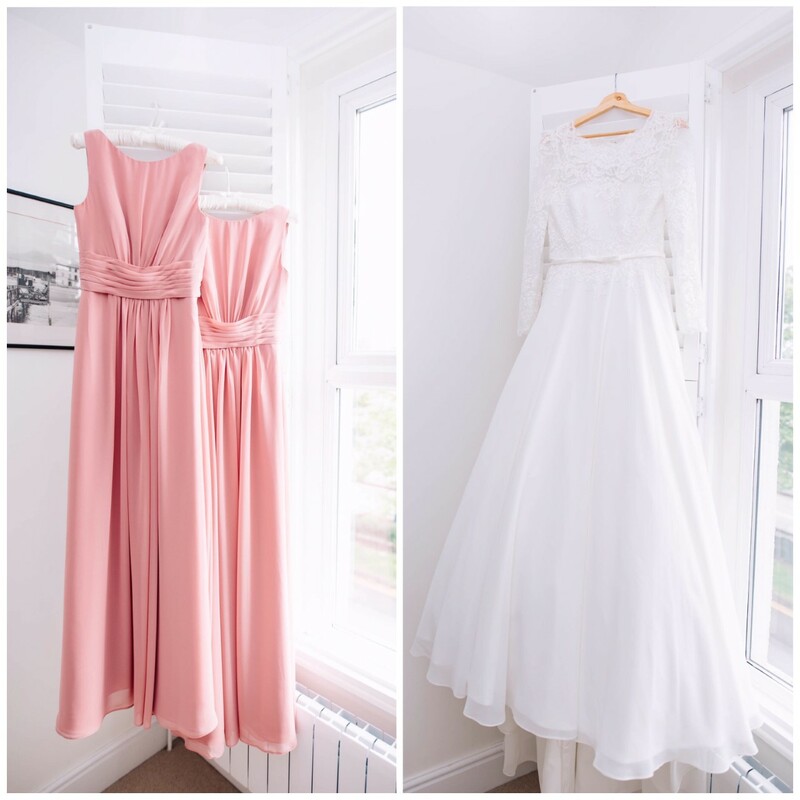 My bridesmaids had their hair styled in a similar way, and wore long, dusky pink bridesmaid dresses. My 6-year old niece was such a fantastic flower girl! She was so well behaved and made me feel calm when I was getting ready on the morning of the wedding. It was a big help for me to focus my attention on her, especially as she was enjoying herself so much. She helped me feel happy and relaxed, and kept laughing and smiling. She loved having her photo taken and being a real life princess. I'll always remember when the florist arrived and I saw all the wedding flowers for the first time...this was a "wow!" moment. 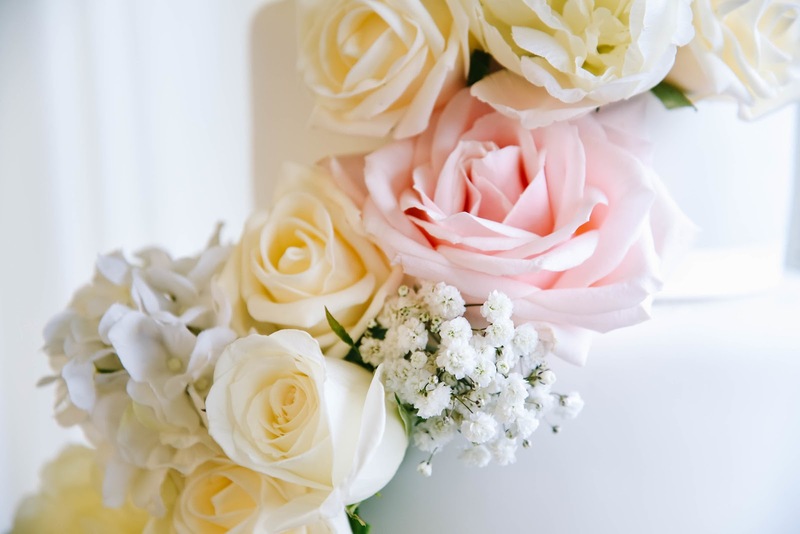 I breathed in the beautiful scent of my bridal bouquet...I hadn't anticipated just how wonderful it would smell! 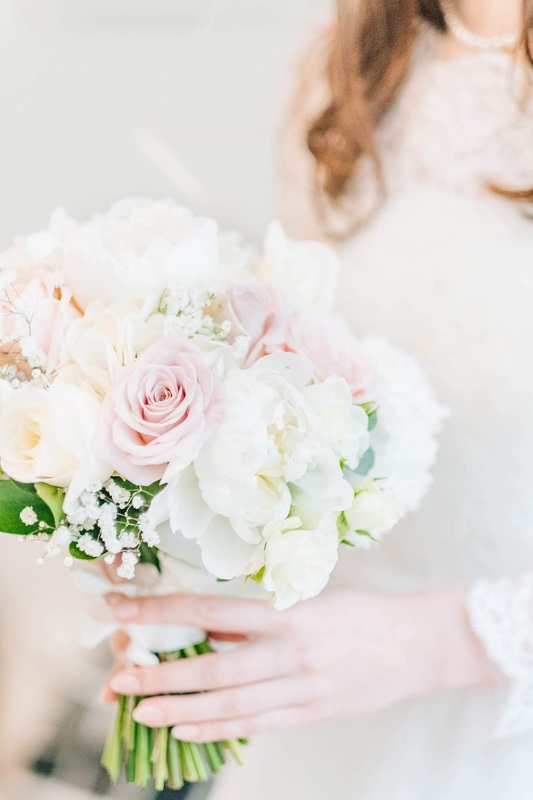 I chose seasonal blooms of ivory peonies, hydrangeas, sweet avalanche roses, blush roses and gypsophilia. Mum helped me get into my dress and did up all 41 buttons on the back (this took longer than we thought it would, but mum brought a crochet hook to help!). My brother Jim stepped in to help me with the clasp of my pearl bracelet and necklace. There was time for a few photos and then all of a sudden, time felt like it was going really quickly, and it was time for dad and I to go to the church. 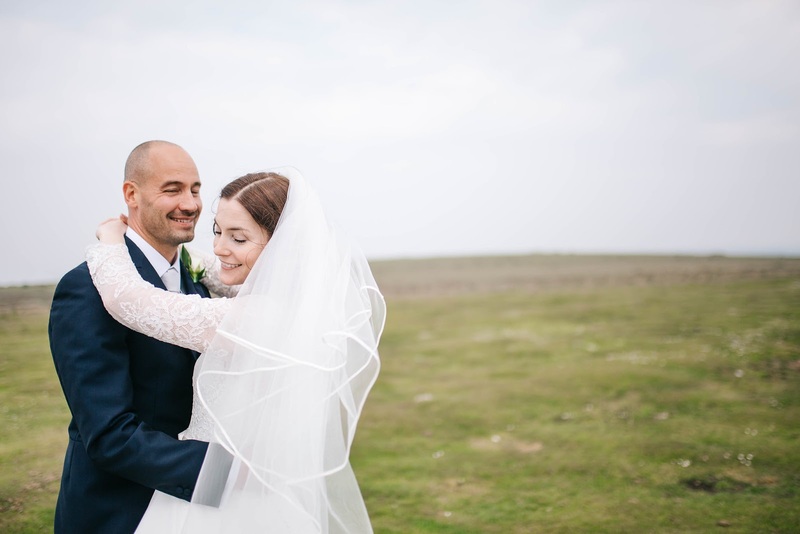 We weren't quite sure what the weather was going to do on our wedding day; just a few days before it was forecast to be sunny, and then it changed to a weather warning with rain forecast! I kept checking the Met Office weather app and it was changing by the hour, so in the end I gave up. As dad and I walked out of the front door, there were people outside on Mumbles seafront who were waiting for The Bride to make her appearance. I didn't realise that I'd have an audience as I walked out to the wedding car! They all cheered and clapped as I got into the car. It wasn't raining but my dad had an umbrella, just in case. Our driver Mike took us through Mumbles towards the church. I felt waves of emotion and found it really hard not to cry. It felt so strange seeing all the Saturday morning shoppers and holiday makers going about their business, and here I was, sat in the back of a Rolls Royce with my dad, on our way to my wedding. 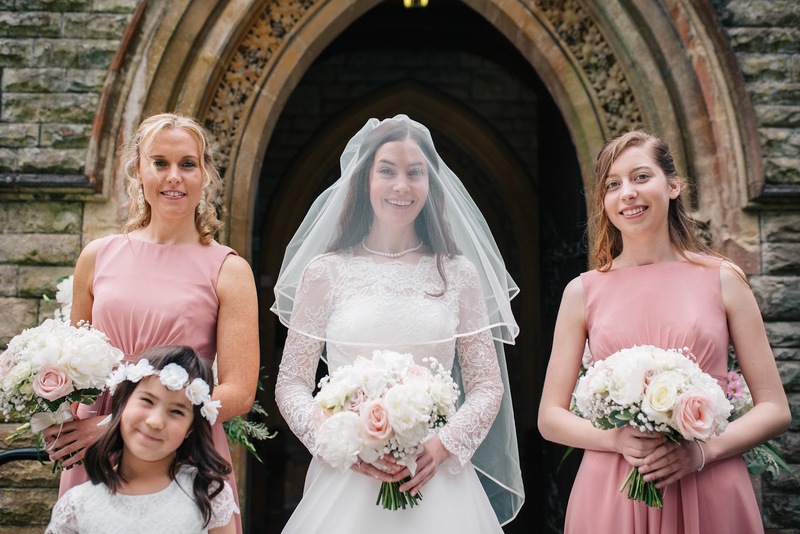 After the last minute rush in the house, we arrived at the church 5 minutes early, and had some photos taken outside. The wedding ceremony was my favourite part of the day. 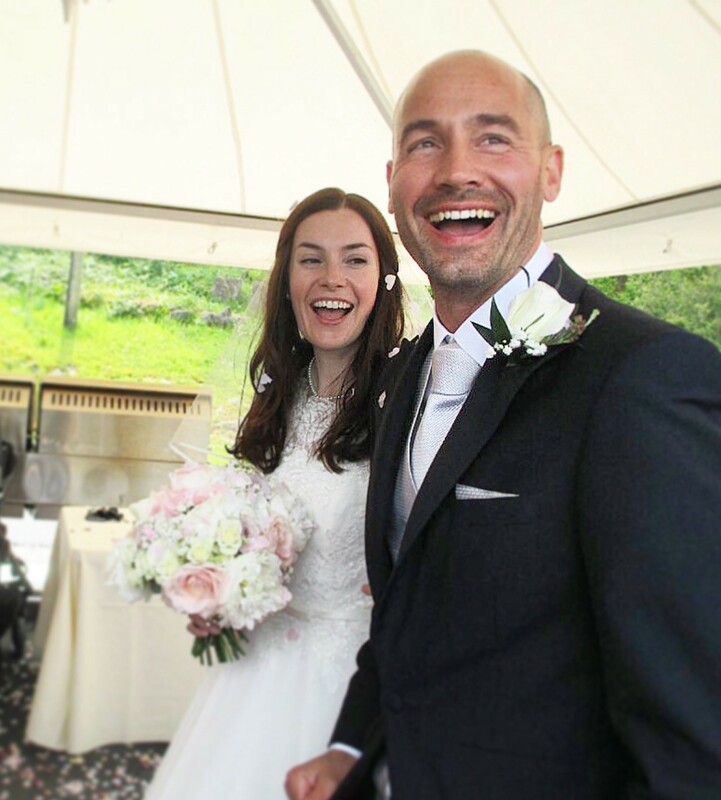 I felt so happy walking down the aisle on my dad's arm and couldn't help but smile and say hello to all the guests! I was worried that I'd be a blubbering mess, but I was fine. 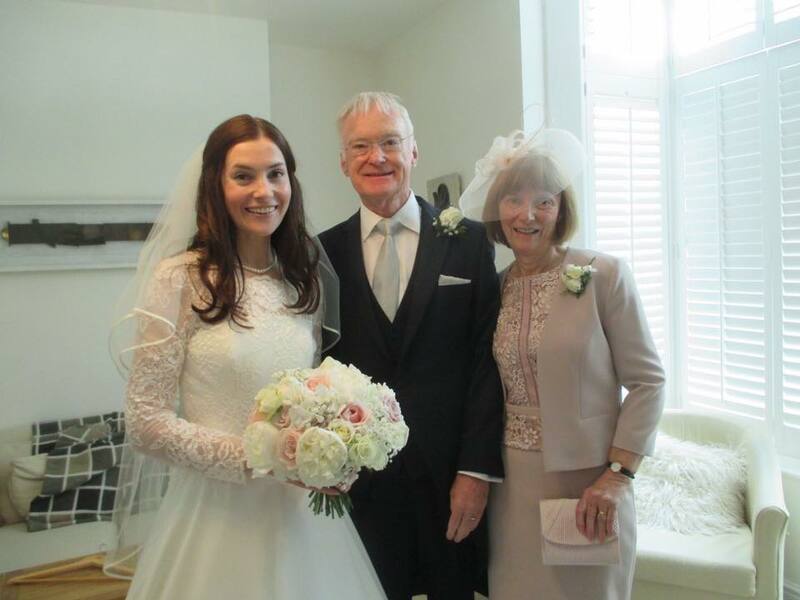 Dad told me afterwards that he felt very emotional walking me down the aisle. 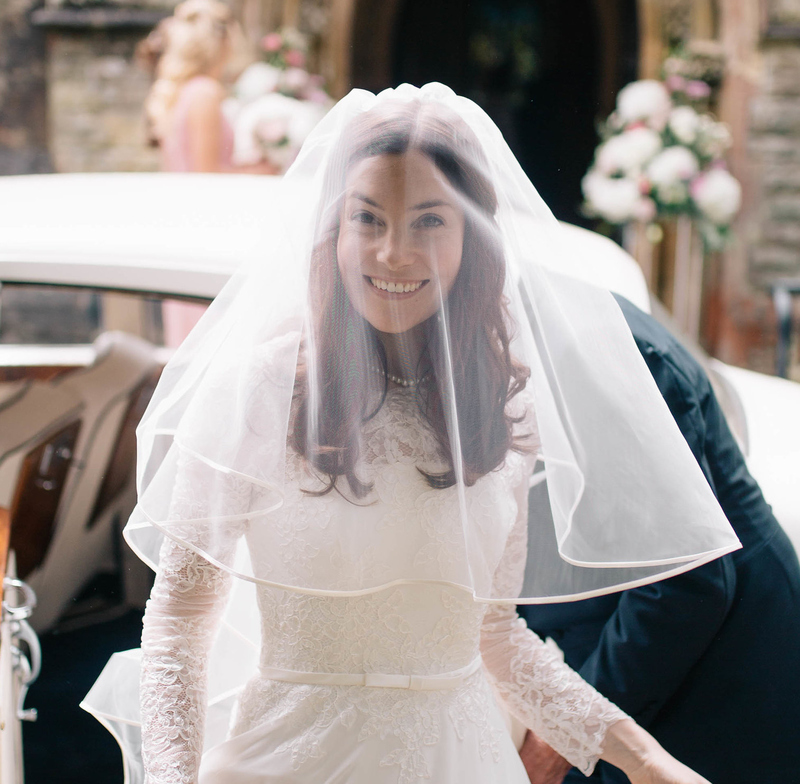 It was such a special moment when David and I first looked at each other, and when my dad lifted my veil. 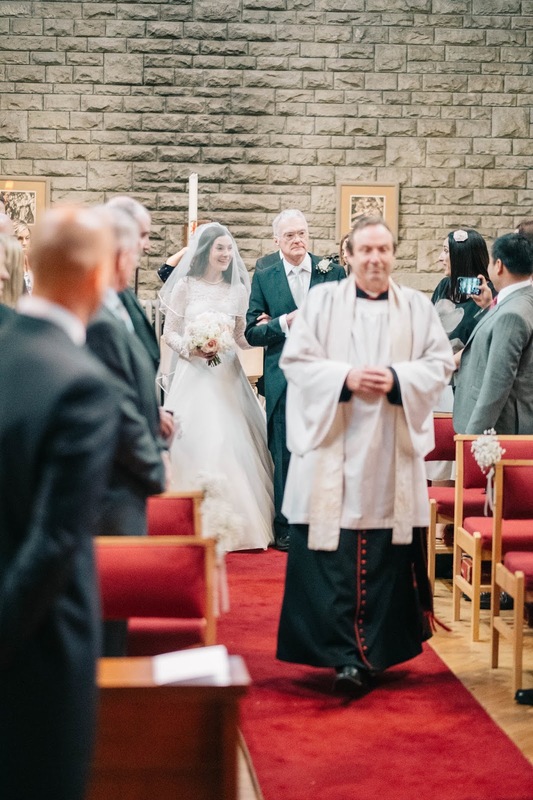 I thought I'd feel more nervous than I was when we were standing in front of everyone in the church, but the vicar put us at ease in the months leading up to the big day and the wedding rehearsal really helped too. I almost forgot that all the guests were seated behind us and focused on David. 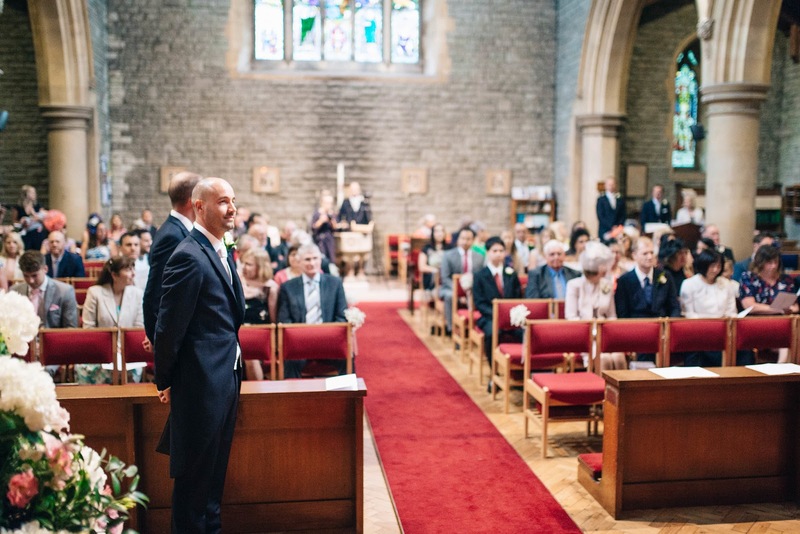 It was reassuring to hold his hand throughout the service. We said our vows, exchanged rings, and then we were married! 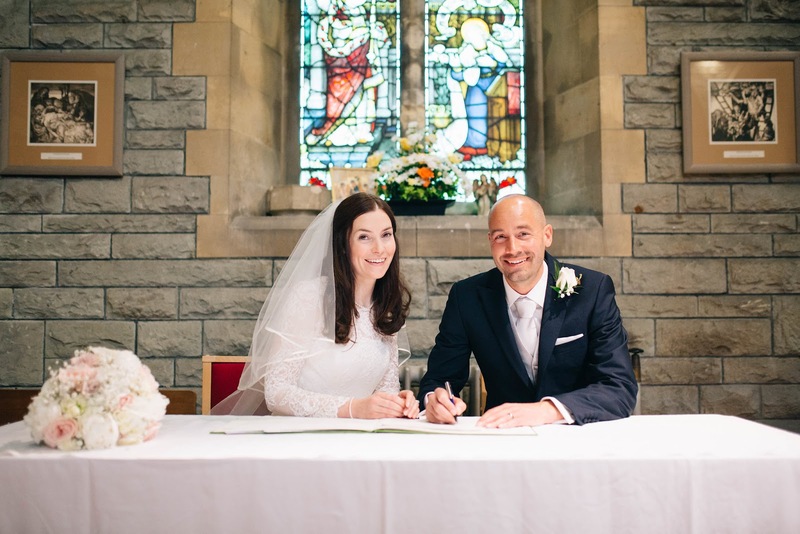 My brother Jim gave a reading and my eldest niece Hannah played Le onde by Einaudi on the piano during the signing of the register, which was very moving and emotional (although you probably can't tell from our smiles!). 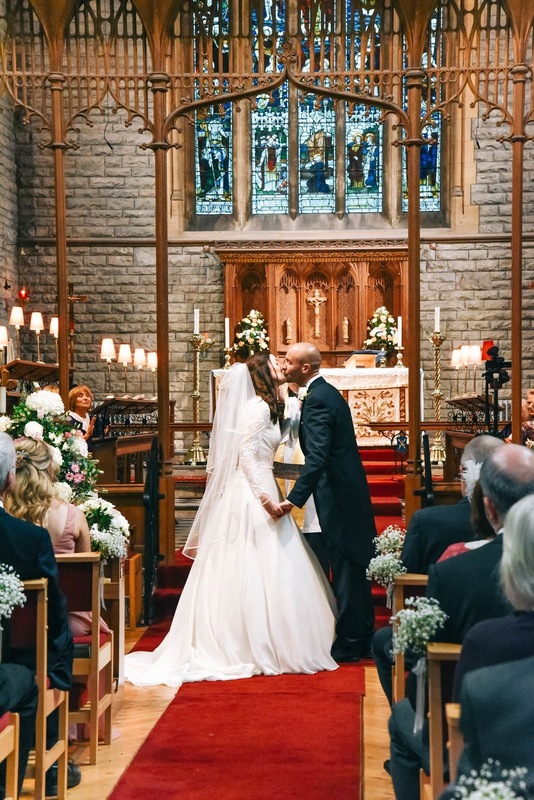 It was a wonderful feeling to be married to my best friend and soulmate; I arrived at the church as a Miss and both of us left the building as Mr & Mrs; husband and wife! As we went to leave the church we realised it was raining and stopped for a moment. And then, as if by magic, the rain stopped! Perfect timing 😊 We had some photos outside the church and our guests threw some of the heart shaped confetti which my dad had made. The little floating hearts of confetti looked so pretty and you can clearly see them in the wedding photos. We both felt so happy! Our driver Mike popped open a bottle of bubbly to celebrate the special occasion. 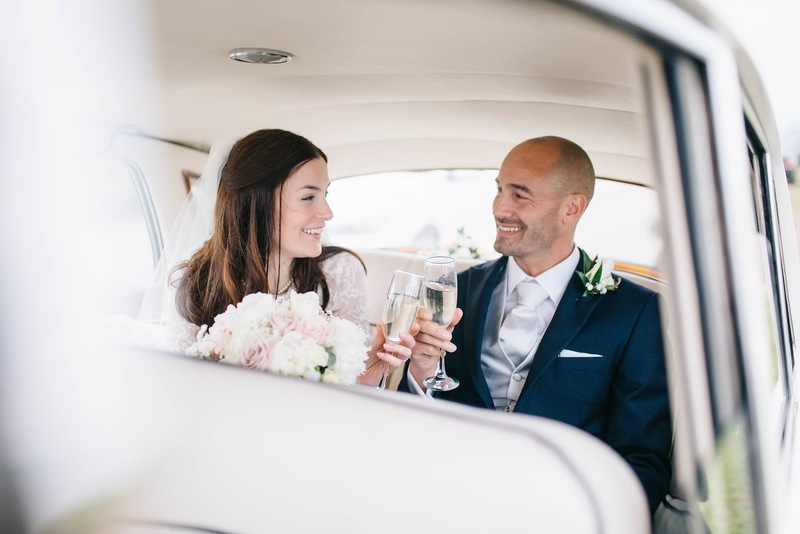 We discovered that the Rolls Royce Silver Cloud previously belonged to the Duchess of Kent, so we really felt like royalty on our special day! As we left the church, everyone cheered and waved us off, and I remember seeing my 6-year old niece looking on with a beautiful smile. We made our way in the car to Cefn Bryn, a hilly common in the Gower Peninsula, where we stopped for some photos. 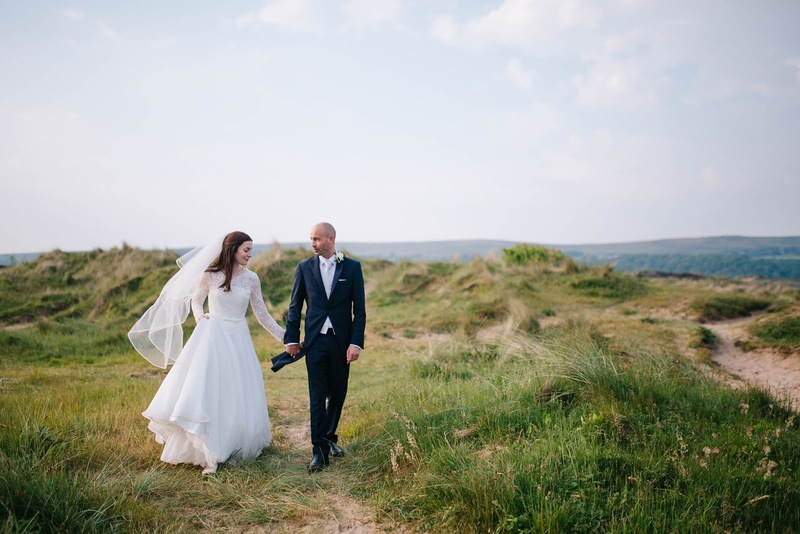 It was so calm and peaceful, and it felt lovely to be alone with David to recharge before heading on to our wedding reception at Oxwich Bay Hotel. 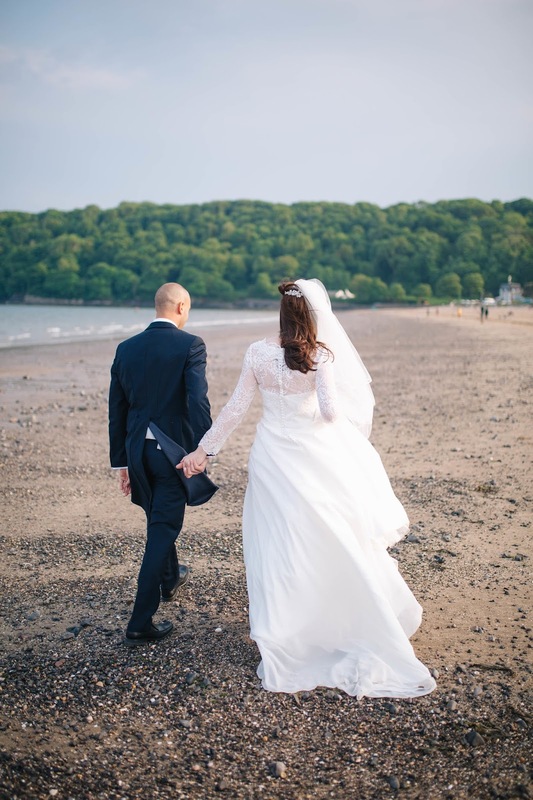 We were so fortunate that we were able to book Oxwich Bay Hotel as our wedding reception on the Saturday of the late May bank holiday because this is usually booked up far in advance. Oxwich Bay is very special to David and I because we went on some lovely beach walks there in the early stages of our relationship, and he loves to Stand Up Paddle board there too. 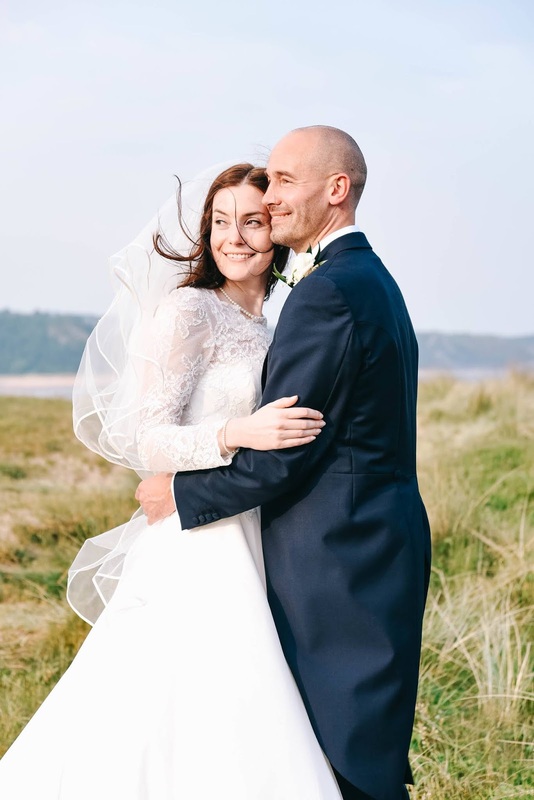 I always dreamed of getting married by the sea, so this really was a dream come true! The wedding marquee overlooks the bay and I don't think that there are many wedding venues in the UK with a view as beautiful as this. Our guests arrived at the drinks reception and sipped bubbly and enjoyed mini burgers in brioche buns. We asked for this because we wanted to do something a bit different to canapés, and there's nothing quite like the sizzle of a BBQ on a summer's day. When we arrived, the sun was shining and there was a big cheer and lots more confetti was thrown as we walked down the red carpet. My niece especially enjoyed picking up the confetti and making it last that bit longer! Our wedding coordinator Emma (who was absolutely fantastic in the lead up to the wedding and on the day itself) led us though to the marquee for us to check that everything was ok. It all looked so beautiful! 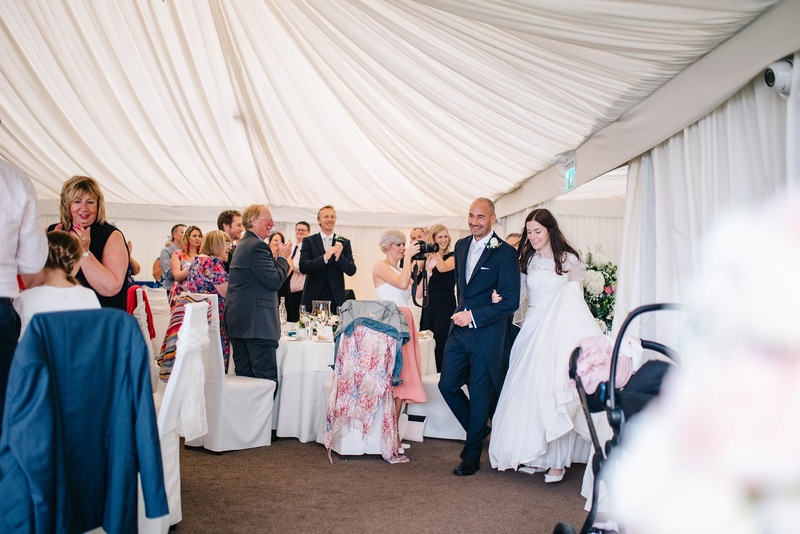 The marquee has ceiling drapes of white fabric which makes it look so light, airy, especially on a sunny day. We didn't go overboard with the venue decorations/extras; we both had a "less is more" attitude to decorating the venue, although we did put a lot of thought into how we wanted it to look. 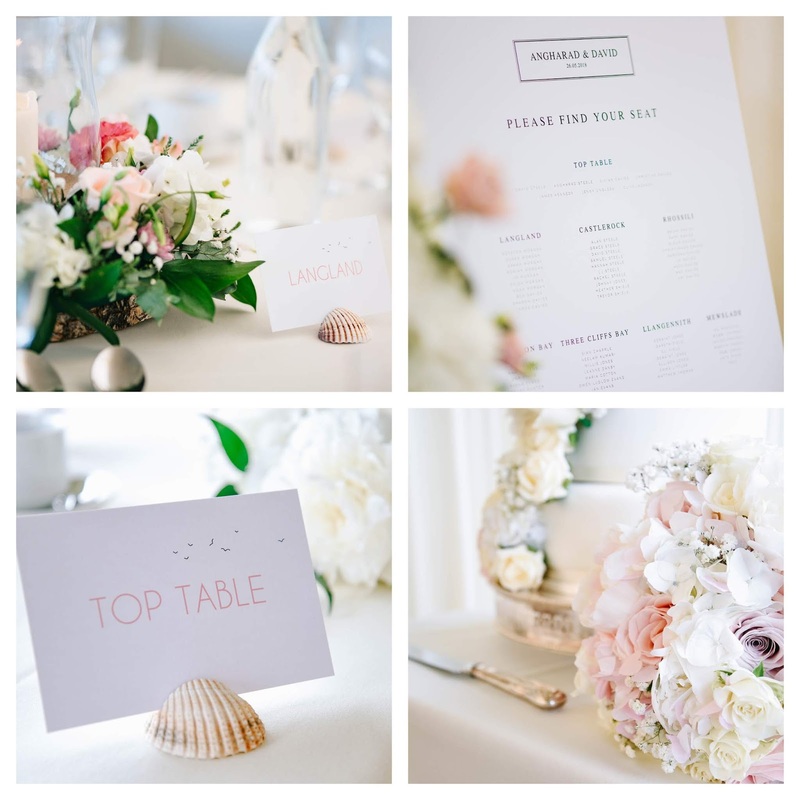 For our seating plan we named the tables after our favourite beaches in Wales and Northern Ireland.The design of the sign for the seating plan was a template I purchased on Etsy, and a local print shop printed it for me. David and I had also collected shells from Oxwich Beach, and his brother kindly helped to make them into place card holders for our guests. The shell place card holders were something a bit different and naturally beautiful for our special day. I purchased the place card holder template on Etsy with a calligraphy style font, and the table centre names were printed by Rosemood, who did our beautiful wedding stationary. For our table centres we had candles in vases with sand at the base, standing on wooden stands with wreathes of flowers around them. The Master of The Ceremony ushered all the guests to their seats, and we followed to the sound of more cheers from our guests. Our friend Chris said grace and then it was time to feast on the wedding breakfast. Our guests had a choice of smoked salmon or melon with raspberry coulis to start, followed by roast beef or chicken, and for dessert there was a dessert platter or sticky toffee pudding. I don't actually have any photos of the food, so you'll just have to imagine how mouth watering and delicious it all was! 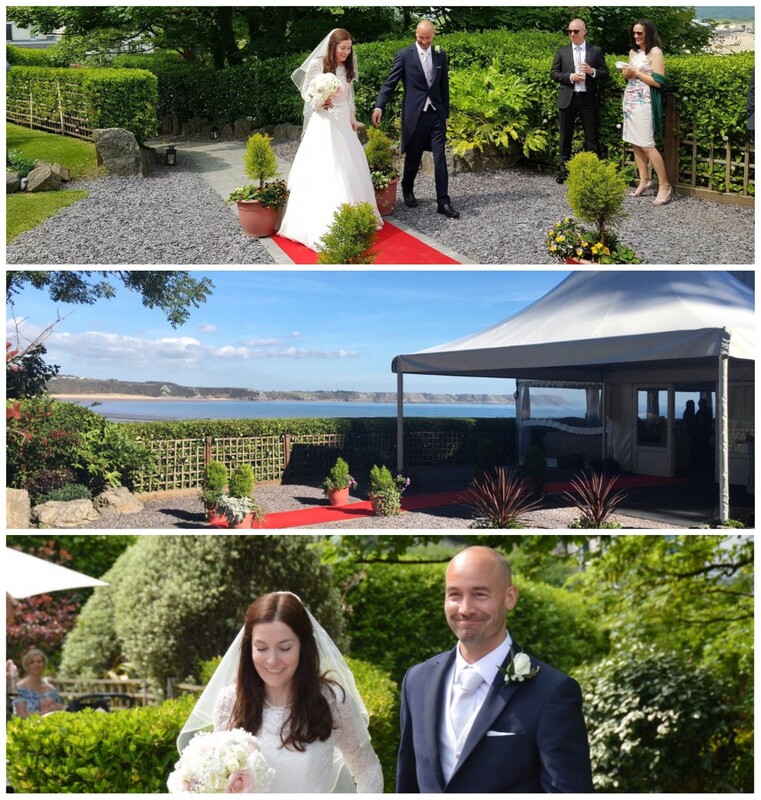 The staff at Oxwich Bay Hotel were extremely attentive and helpful, and made sure that everyone was happy. We decided not to get wedding favours for our adult guests, and instead we made a donation to Dogs For Good on their behalf. The children had little wedding favours of personalised colouring books with crayons which I purchased from Etsy. Our family commented that the childrens' favours was a lovely thoughtful gesture, which meant a lot. 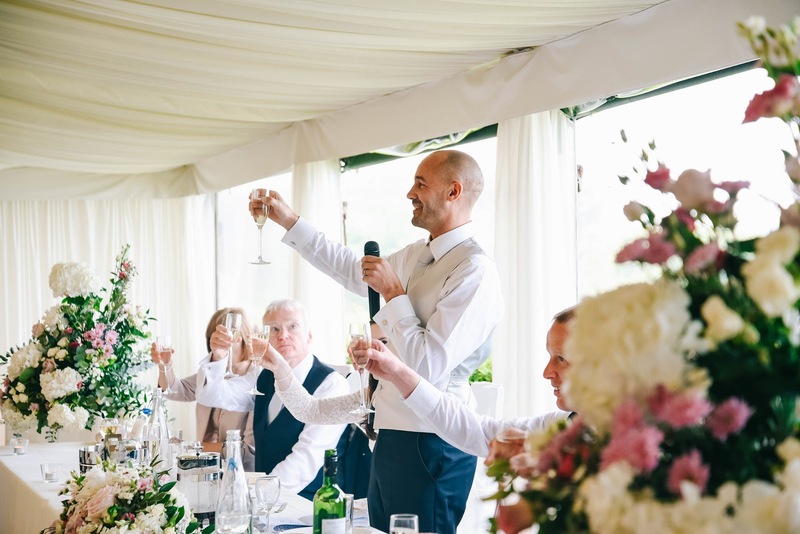 David and I had put together a wedding playlist of our favourite tunes which played during the drinks reception and meal. 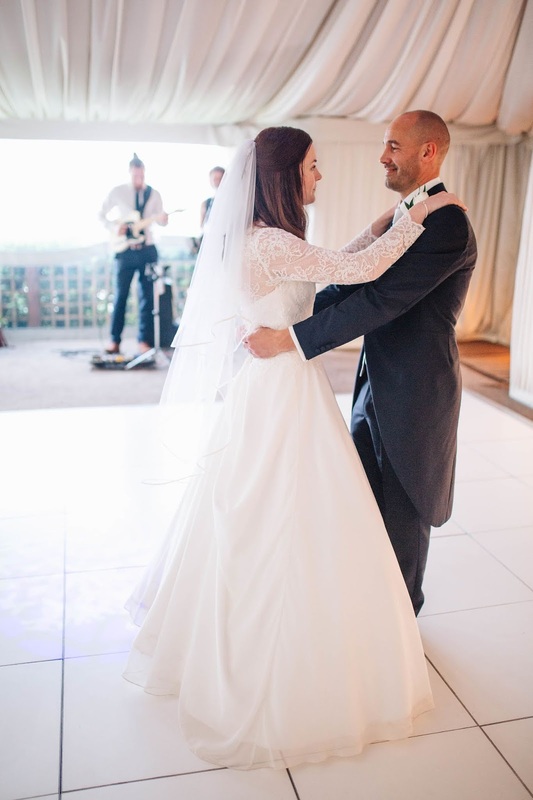 This had taken us quite a while to do in the lead up to the wedding, but we were glad that we'd done this because it was nice to enjoy some of our favourite music. I felt so happy to sit on the Top Table and see all our guests enjoying themselves. 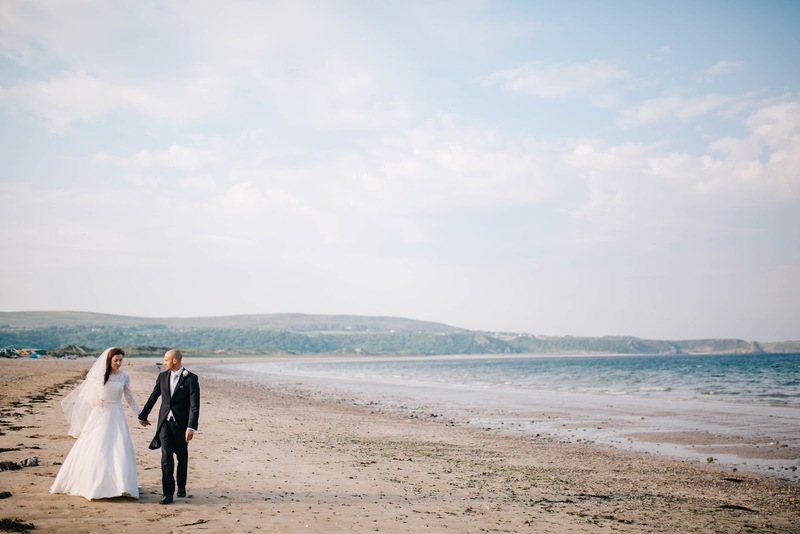 We made sure that the Top Table was facing away from the view of Oxwich Bay, so all our guests could enjoy the view. At one point we opened up the marquee windows because the sun was shining and it was so lovely. I remember the moment my mum told me that she didn't want it to end; the atmosphere was so happy and relaxed. There were traditional speeches and toasts at the end of the meal from my dad, David and the best man James. David's parents weren't able to attend, so they prepared some heartfelt words which were shared with our guests. Again, it was very hard not to cry; I felt so happy and moved. I never thought I'd meet someone as wonderful as David. After the meal, David and I had some more photos on the beach. 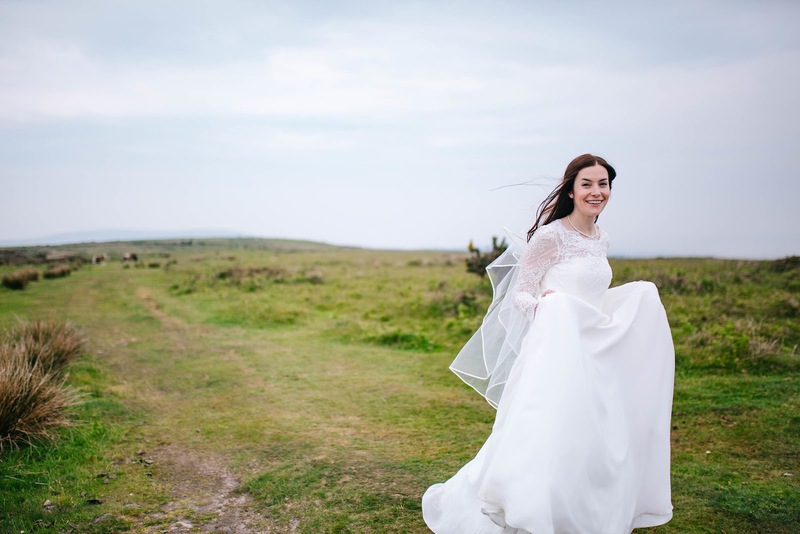 It was fun walking along the sand in my wedding dress and waving to the people enjoying a day out! At one point my veil blew off, but David caught it for me. Most of the photos were natural and weren't too posed, and we enjoyed the peaceful moments in the beautiful setting. 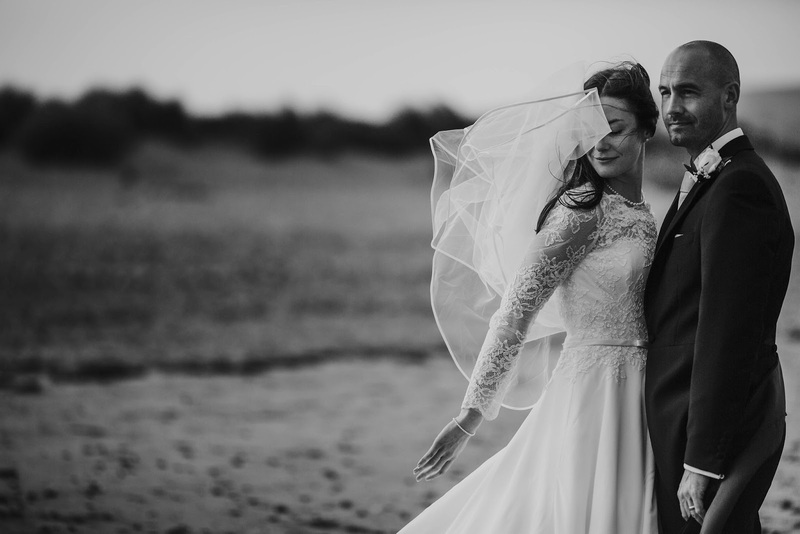 We walked back along the beach and our guests waved to us from the marquee in the distance. 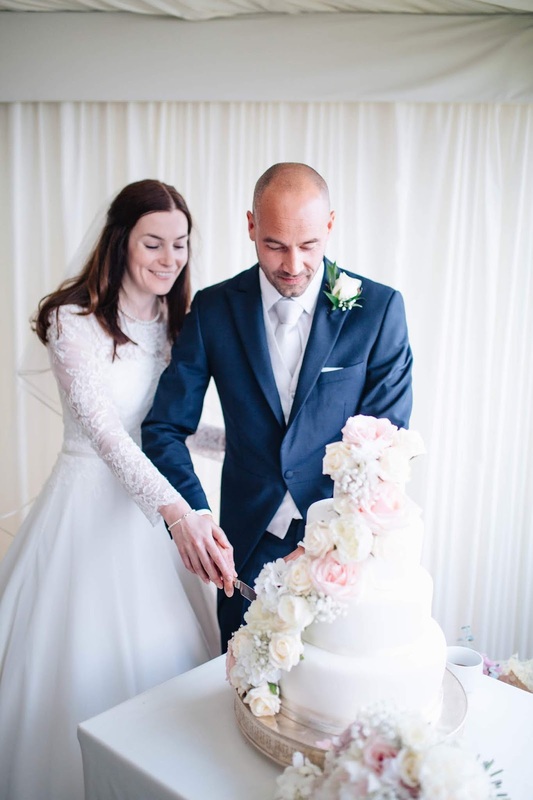 When we got back to the reception it was time for us to cut the cake! I loved my wedding cake so much. 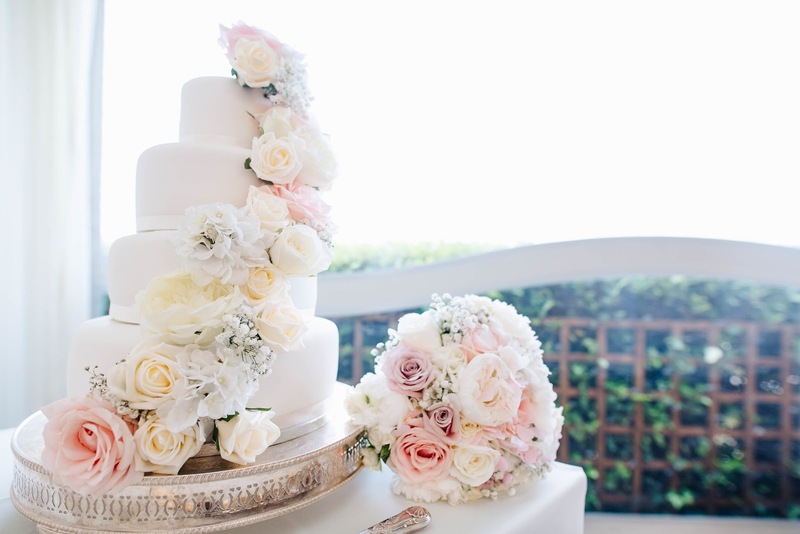 I wanted the cake to be beautiful and elegant, without being too OTT, and I think we achieved this.We got the cake from M&S; it was a vanilla sponge cake with raspberry jam and buttercream filling. The florist decorated it with real and artificial flowers to match my bouquet. I showed her a photo of my dream cake on Pinterest which she recreated for me. We wanted our guests to be able to enjoy each other's company and to have a proper conversation with each other, so we decided to have a live acoustic act instead of a band. Louise Victoria sang some beautiful Live Lounge style covers (Al Green, Adele, Sam Smith, Norah Jones) accompanied by her guitarist. We had lots of compliments on how lovely her voice was and the choice of songs. We had more food served for our guests during the evening break; fish & chips, bacon butties and more wedding cake, all of which went down very well! We also had a Fujifilm Instax camera for our guests to take photos and selfies and post a message in the guest book. We really enjoyed reading these afterwards! Later on, the DJ played for all the night owls who wanted to have a boogie. As our last guests left, there was a show of thunder and lightning over Oxwich Bay, which was great fun to watch and a dramatic end to our amazing and unforgettable day. 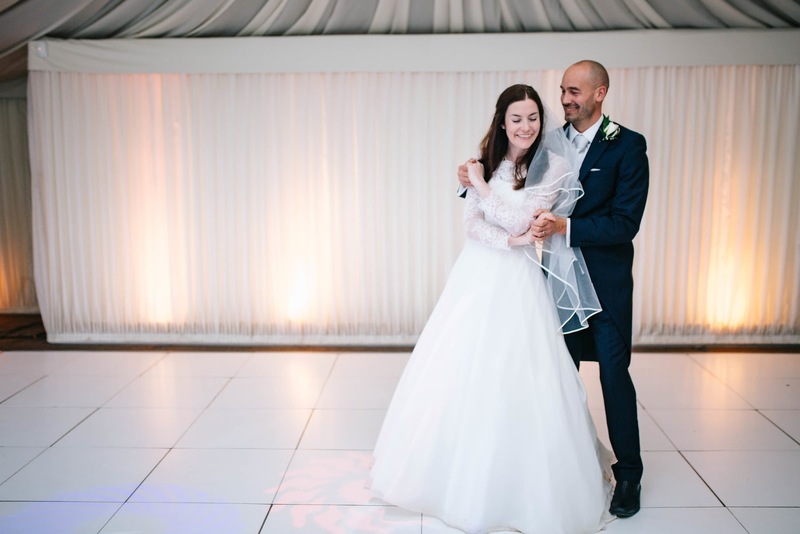 Our wedding day was everything I had ever dreamed of; all the organisation, hard work and stress in the months leading up to the big day was worth it. 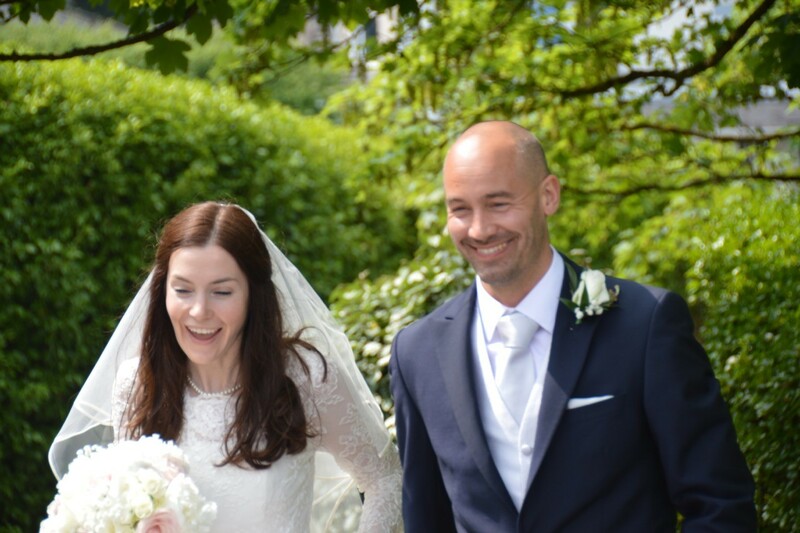 I felt so happy and emotional; it had been such a lovely day, and I was now married to my gorgeous husband and ready for the next exciting chapter of our lives together.